Quiet weather always presents an easier forecast. Sunshine and below average temperatures are expected through at least Wednesday. Of course, we'll notice the sunrise occurring about an hour later thanks to daylight saving time and therefore sunlight will stick through 7pm moving forward. Today and Tonight: As straggling clouds bust out of the area through Monday morning, ample sunshine will dominate skies with northerly breezes limiting high temperatures to the low 60s. A clear and chilly night will follow with low temperatures near 40 degrees. Like last week, traditional cold spots could achieve the upper 30s with patchy frost. 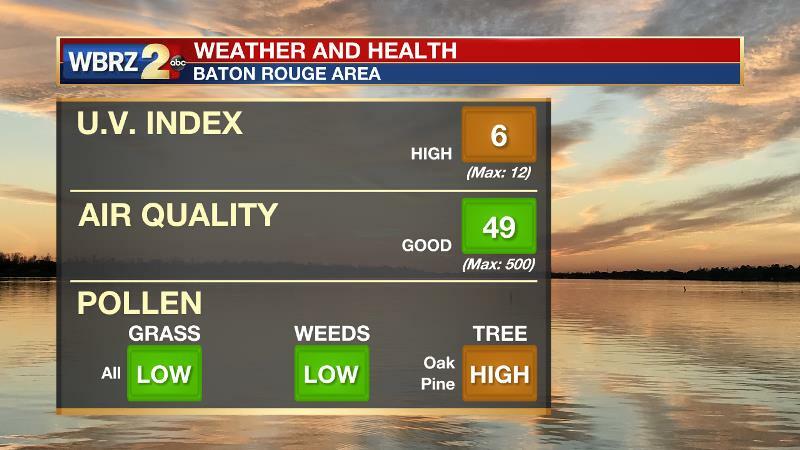 Weekend rain tempered grass pollen for the time being pine oak and pine continues to have tree pollen running high. The weekend weather did not play out as expected with Friday’s forecast. Showers and thunderstorms developed on Saturday morning in the Gulf of Mexico, robbing energy for any inland activity in the afternoon hours. Meanwhile, a cold front slowed down and therefore rain lingered about 12 hours longer than originally expected. Up Next: The week ahead will see mainly clear skies and below average temperatures. Some nights may dip into the 30s. That being said, freezing temperatures are not expected. Areas in southwest Mississippi will likely be in the 30s for several nights. Temperatures will eventually begin to moderate as we approach the latter part of the week. Temperatures then go back to above average by nudging into the 80s for the weekend. 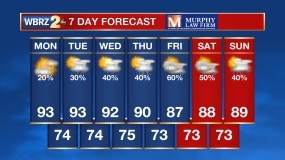 The warmer readings may come with a few more clouds and possibly a spotty shower, but at this time, significant rain chances look like they will hold off until at least next week. 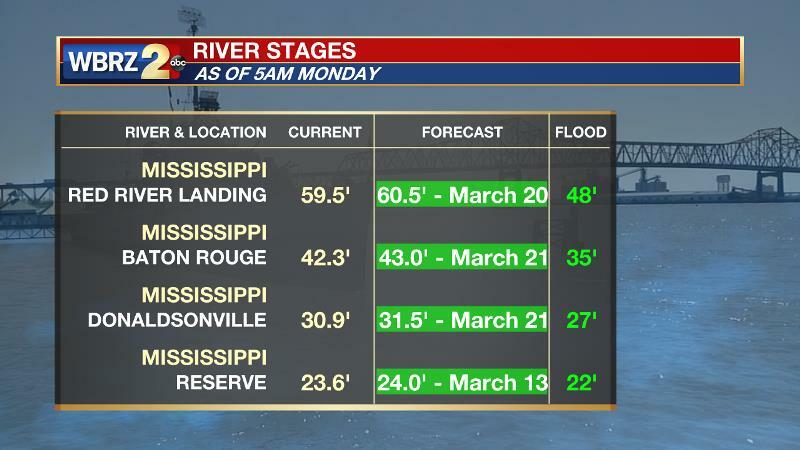 The Mississippi River is expected to crest within the next week, around March 20. Given the current forecast, impact outside of the levees is expected to be minimal with the exception of soppy land around the Angola farms and by the LSU veterinary complex. Due to the extended period of high water, some increased seepage may be noticed along levees. However, remember that the city of Baton Rouge is protected by the levees up to at least 43 feet. On the river, traffic and industrial operations will be restricted. The pattern will be plugged up through Wednesday as the Northeast experiences yet another winter storm. Surface high pressure will therefore only slowly migrate from the Upper Midwest to the Gulf Coast. The good news about this stalled pattern for the local area is that it is one of quiet weather. Some clouds are pushing through the region associated with the cooler air mass moving into the area. Skies should trend clearer into the afternoon hours as the cold front moves farther into the Gulf of Mexico. Forecast models did not perform very well last week and that may continue to be an issue this week, especially with regard to low temperatures. Thanks to very dry air, lows should be able to achieve the upper 30s and low 40s each morning through Thursday. No freezing temperatures are expected but typical cold spots north of I-12 could see some light frost. As you would expect in the transitional seasons, models struggle with the long range forecast. While it looks as though as trough will form in the Western U.S., the question lies in when this trough will eject eastward and return unsettled weather to the central Gulf Coast. The ECMWF model breaks the trough free earlier and therefore paints a wetter picture for Friday through Sunday. The GFS model keeps a ridge over the region through Sunday, which would mean almost entirely dry conditions. Of note, the National Weather Service is favoring the GFS model, however the ECMWF model performed much better with last weekend’s system. Both models do agree on above average temperatures from the end of the week into next week.